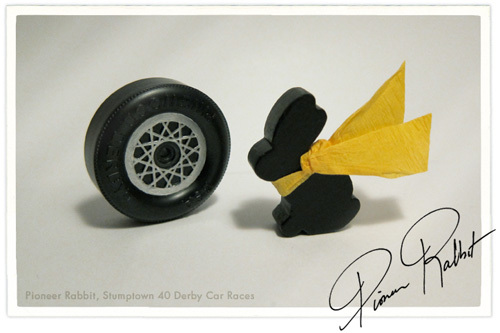 Last night fifty competitors raced in the Stumptown 40 pinewood derby car competition, and me and my pioneer rabbit were right in the thick of it. It was a night of competition, camaraderie and old fashioned fun. Seeing the different car designs, from a classic racer to a gumby-shaped car, was a spectacular study in homegrown aesthetics. My friends Laura and Scott made cars that looked like a pantone swatchbook and a wedge of cheese, respectively. I gave my car the moniker Danish Dynamite, from the chant “We are red, we are white, we are Danish dynamite!”. My sister and I were the only two people at Spirit of 77 who knew the chant, so it was a small cheering section indeed. My entry fared well initially, but was finally ousted in the consolation bracket by a car shaped like a bottle of ketchup. Ahh, well, you can’t beat the condiments. My car Danish Dynamite and driver Pioneer Rabbit make quite the pair! See my outfit that day: why not! 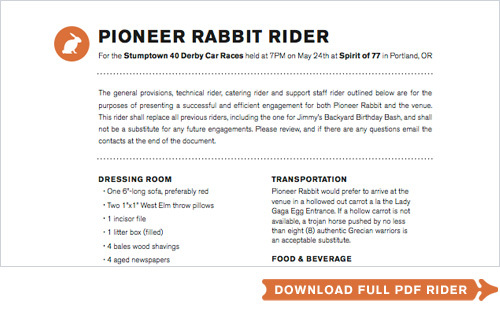 After reading an article on The Smoking Gun about the Foo Fighters’ rider, my pioneer rabbit started to get real persnickety leading up to his participation in the Stumptown 40 Pinewood Derby Car Race. So he hired a crack legal team to craft a ridiculous rider. Probably never should have taken those glossy head shots. Rabbit knows what rabbit wants, I guess. 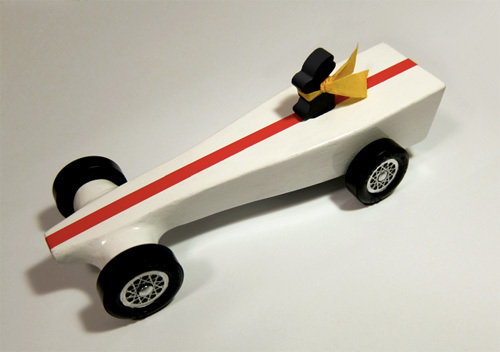 A month or so ago my friend Melissa told me she was entering a pinewood derby car race with AIGA. It sounded like a lot of fun, so I signed up too. 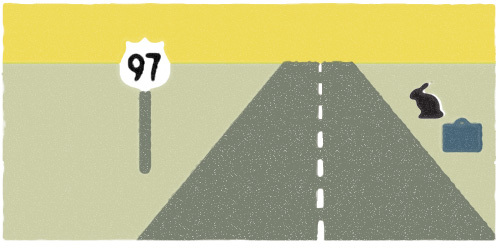 Organized by Dave Selden and Ryan Parr, the event is called Stumptown 40 and is the creative person’s chance for glory in the cub scout arena. Selecting my driver for the race was a no brainer: my pioneer rabbit…seen here posing next to his custom rims in his first glossy headshot promo. Summer is almost here, and you know what that means…BBQ season! So I’ve created a miniature ode to the two most common condiments used at outdoor soirées, picnics, beach bonfires, camping excursions, tailgate parties and Fourth of July fests. Here’s some typographic ketchup and mustard for all your summer celebration needs. I looooooooooove to work on food identity and packaging, so when Substance contacted me to help work on a new gelato product, I was psyched! Their long-time client Gelateria Naia was preparing to unveil a gelato in bar form, and needed branding to support their pilot efforts. While Substance managed the project, marketing and created the Bar Gelato website, I was focused on making a custom logotype and labels for their first run in stores. After lots of sketching, we agreed a “just gelato” approach was best, using a simple and bold type treatment reminiscent of window signage. Orange worked two shifts as a bright and cheerful color that stood out against the bars while nodding to colors used in Naia’s branding. 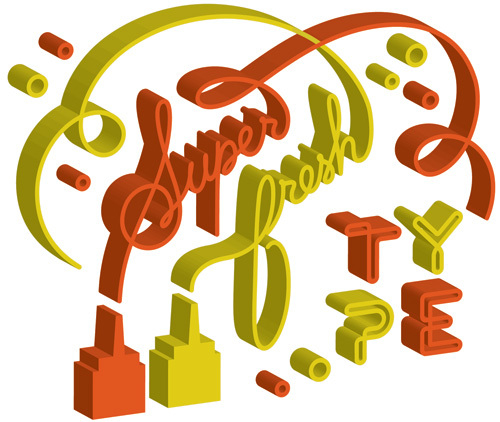 Created from a scanned type sample called Kent Sans, and altered generously to become Bar Gelato. To get into the gelato mindset wasn’t hard, as I often think of what’s for dessert after I’ve finished lunch. And I was in luck, because Naia had sent Substance a batch of sample gelato bars, which I nabbed six of for a personal tasting session. 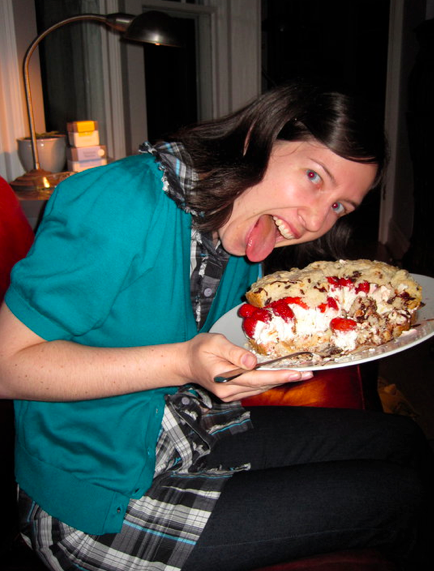 And thus began the Great Gelato Hoarding of 2011. Knowing that I only had a limited supply, each night I cut 1″ chunks off of each bar and then stapled shut the cellophane wrapper to keep it fresh for the next “serving”. Out of 6 bars, I made about 30 mini-desserts (except for the hazelnut bar which I ate in one sitting because I couldn’t help myself). These gelato bars are the most delicious thing I’ve tasted in a while! Nom, nom, nom. There are plenty more flavors in a select central coast California Whole Foods. 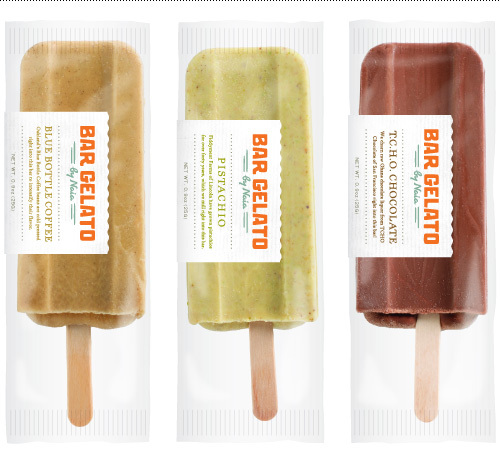 The first roll-out of Bar Gelato in San Francisco and other Central Coast California locations has gone very well, and I encourage any of you Californians to stop into a Whole Foods to try a bar or two. OR, buy some and put them in one of those styrofoam coolers made for shipping things like special Danish hotdogs or other perishables, and send them to me. I will take gooood care of them, I promise. Label close-up and gelato bar seal quartet. Thanks for having me, Substance…and to any other artisan food creators out there who provide samples to inspire their designers – bring it on!